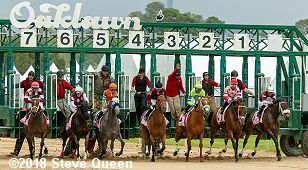 The $700,000 Apple Blossom Handicap (G1) is the major race for older fillies and mares at Oaklawn Park, kicking off closing weekend at the historic Hot Springs oval. An estimated 18,500 were on hand on Friday afternoon for this 1 1/16 mile trip under dark overcast skies, intermittent rains, and temperatures in the low 70's. Breeders' Cup Filly and Mare Sprint (G1) 7th place finisher Unique Bella was sent off as the 1-5 favorite in the field of 7 off wins in the La Brea (G1) and Santa Maria (G2). 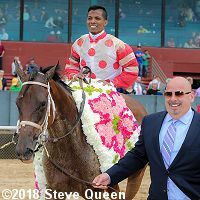 In to challenge her included 9-2 second choice Unbridled Mo, 4th in the Royal Delta (G3), and 14-1 third choice Streamline, 8th in the Azeri (G2) after winning the Bayakoa (G3). 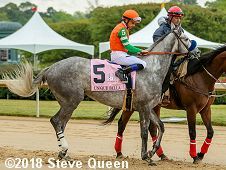 Jockey Channing Hill sent 17-1 fourth choice Farrell to the lead first time by and she set fractions of 23.41 and 46.94 while as many as 2 1/2 lengths in front of Unique Bella. in turn 2 1/2 lengths ahead of Streamline. On the far turn Farrell tired as Unique Bella easily inherited the lead through 3/4 in 1:11.40. Unbridled Mo, 4th early, and Streamline both moved up to challenge through 1 mile in 1:37.35, but Unbridled Mo accelerated when asked by Mike Smith, finishing 2 1/4 lengths ahead of Unique Bella in 1:43.94 over the good, sealed main track. It was another 2 1/2 lengths back to late-running 57-1 Fuhriously Kissed third. Left: Unbridled Mo in the winner's circle. 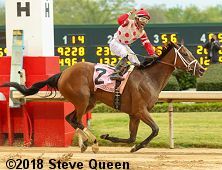 Winning owner Stephen Brunetti said, "This is our�first time we've ever been to Hot Springs, and I'm sure we'll be back again. We were going back and forth between a couple of different races and Todd told us how well she was training and he said, 'Let's take a shot in the Apple Blossom.' You never knew what would have happen with Unique Bella. She was shipping and it was a sloppy track. Just all worked out for the best." Right: Ricardo Santana Jr. celebrates after the race. He said, �"We got a good break. I was scared during the first turn when I had to stop her a little bit, but I knew she was coming back. I was sitting 4th and at the 5/8 I took her out a little bit and then she came on pretty good. At the 3/8, I was just waiting for the turn for home because I didn't want to move too soon. When I turned for home, I asked her and her class won out." Right: Unbridled Mo in the post parade. 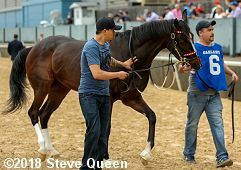 Winning trainer Todd Pletcher said, "We were kind of kicking around a couple of different options. Most importantly, the filly was training extremely well and seemed like she was sitting on a good race. We thought ultimately a Grade 1 was sort of the only thing missing on her resume. She's a very consistent mare. We knew that there's a very short-priced favorite we had to beat. We felt like if she'd won, even if she was second or third, if would be a positive result. Decided to go ahead and take a shot and very happy that we did." 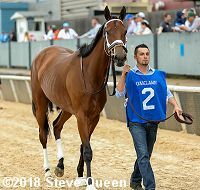 Left: Second place finisher and beaten favorite Unique Bella in the post parade. Jockey Mike Smith said, "She's squatted in the gate. I was trying to stand her up. The next thing I knew they opened the gates and she squatted back. She totally missed the break. I wish I could have stayed last. If I could have, I would have. She was very strong and very fresh. After she got left, she just wanted to catch up. I could have thrown her down, but I never had to do that and I wasn't about to start. It was just unfortunate." Right: Third place finisher Fuhriously Kissed in the post parade. 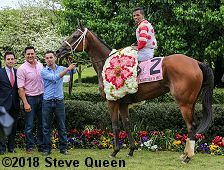 Trainer Tony Quartarolo said, "I give the credit to the owner (Ronald Paolucci of Loooch Racing Stable). He picked her out. She ran great. We were hoping for moisture in the track and we got a little, so it worked out. C.J. rode her great." Jockey C.J. McMahon added, "It set up perfect just like I mapped it out. I saved ground when I was able to break. She broke good with her feet underneath her. I dropped down to the fence as soon as I could, being in the three hole. With speed in the race it worked out perfect. Coming down the lane she hesitated just a tad passing on the fence but when she got through she galloped out great. Anthony did a fantastic job and I appreciate the opportunity." Left: The post parade for the Apple Blossom. 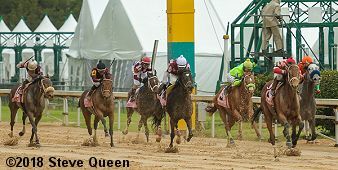 Right: The fillies and mares break from the gate for the Apple Blossom. 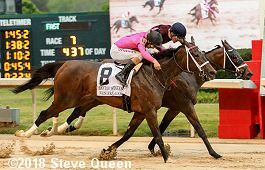 An hour before the Apple Blossom, a field of 8 three-year-old fillies contested the $400,000 Fantasy Stakes (G3) going 1 1/16 miles at Oaklawn Park, with the winner earning 100 points as part of the Kentucky Oaks Championship Series. 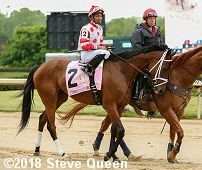 Dixie Belle Stakes winner Amy's Challenge was sent off as the 7-5 favorite off her runner-up finish in the Honeybee (G3). 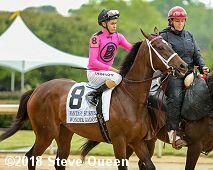 In to challenge her included 2-1 second choice Wonder Gadot, 3rd in both the Rachel Alexandra (G2) and the Fair Grounds Oaks (G2), and 9-2 third choice Cosmic Burst, winner of the Honeybee. 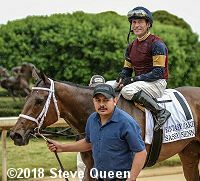 Jockey Mike Smith sent favorite Amy's Challenge to a clear lead first time by and she blazed through fractions of 22.87, 45.88, and 1:10.52 while as many as 5 lengths in front of 11-1 Sassy Sienna in turn 2 lengths ahead of 7-1 Harbor Lights third. Amy's Challenge continued to lead into the stretch through 1 mile in 1:38.56 before tiring. Wonder Gadot moved up to gain a short lead inside the 1/16 pole but Sassy Sienna, confidently ridden by Gary Stevens, rallied to get up by a nose in a tight photo in 1:45.63 over the fast, sealed main track. It was another 2 1/4 lengths back to favorite and pacesetter Amy's Challenge third. 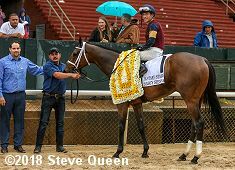 Left: Sassy Sienna in the winner's circle. Winning trainer Brad Cox said, "She had to dig in. In the last 1/16, I didn't know if she was going to win it or be third. I was kind of thinking she was going to be third. She ran a tremendous race. She's a very tough filly who always gives you all she's got. Hopefully, we've got some left for three weeks from today. We've liked her all along. She's shown us a lot from the get-go, and now it's on to the Oaks. 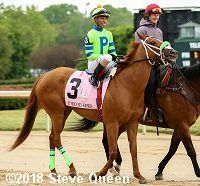 (Stablemate) Monomoy Girl probably has a little more natural speed, but she doesn�t have to be on the lead. (Sassy Sienna) obviously has speed. We kind of chased a filly around there today that has a whole lot of speed. They were workmates in the fall. They definitely know each other. They worked with each other twice. 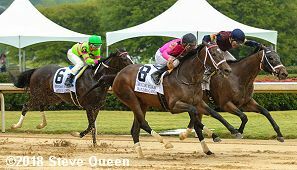 They�re both good fillies and they both earned a spot in the Kentucky Oaks." Left: Second place finisher Wonder Gadot in the post parade. 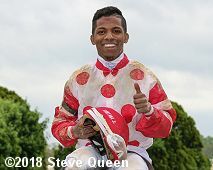 Jockey David Cabrera said, "The filly ran it really good. She relaxed really good. She fought all the way. I thought for a little bit that we were the winner, but that other horse just kept on kicking." Right: Third place finisher and beaten favorite Amy's Challenge walks over before the race. Jockey Mike Smith said, "I just couldn't get her to turn off. When the track is sealed like that, it can really make a lot of noise and she just kept running from it. I tried to slow her down and it made it worse. I was stuck between a rock and a hard place. She just didn't get into a rhythm."